United Nations, 14 September 2018, UN News — While health, education, and income levels have improved overall across the globe, “wide inequalities” both among and within countries, are casting a shadow on sustained human development, a new United Nations report shows. Looking at the widening gap in real terms, a child born in Norway today – the country with the highest human development index (HDI) – can expect to live beyond the age of 82, and spend almost 18 years in school. But the same child, if born in Niger – the lowest HDI – can expect only to live to 60, with just five years of formal education. “While these statistics present a stark picture in themselves, they also speak to the tragedy of millions of individuals whose lives are affected by inequity and lost opportunities, neither of which are inevitable,” said Achim Steiner, the Administrator of the UN Development Programme (UNDP), which released the report today. Furthermore, while there has been “laudable progress” in the number of girls attending school, there remain big differences in other key aspects of men and women’s lives – for instance labour force participation rates for women globally are lower than for men – 49 per cent, versus 75 per cent. My pioneering publication, The Olive Tree, was launched in 2017 precisely in order to help the Travel & Tourism industry enhance its contribution to Human Development and the UN Sustainable Development Goals. Click here to download all the nine back issues published so far. And when women are working, their unemployment rates are 24 per cent higher than their male counterparts. Women globally also do much more unpaid domestic and care work than men. 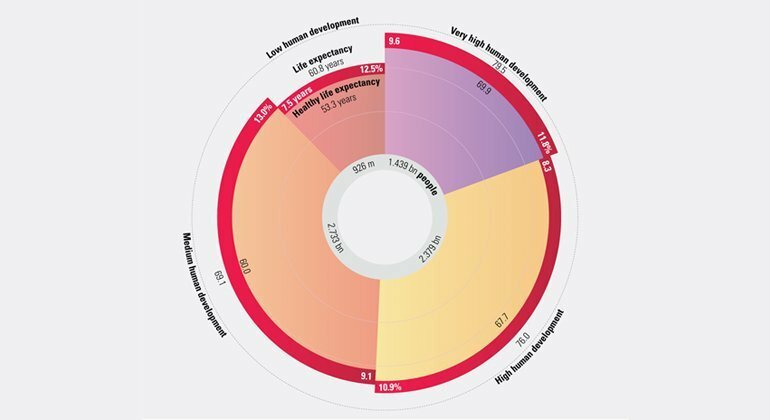 The Human Development Report 2018 update also shows “tremendous” variation between countries in quality of education, healthcare and many other key aspects of life. “Much of the world’s attention is on data that tells only a part of the story about people’s lives,” said Mr. Jahan, highlighting that it is clearly not enough simply to count how many children are in the classroom. The important dimension is to know whether they are learning anything. UN News spoke with Mr. Jahan about the report’s findings. Listen to the interview here. Looking back over almost three decades, all regions and human development groups have made substantial progress. 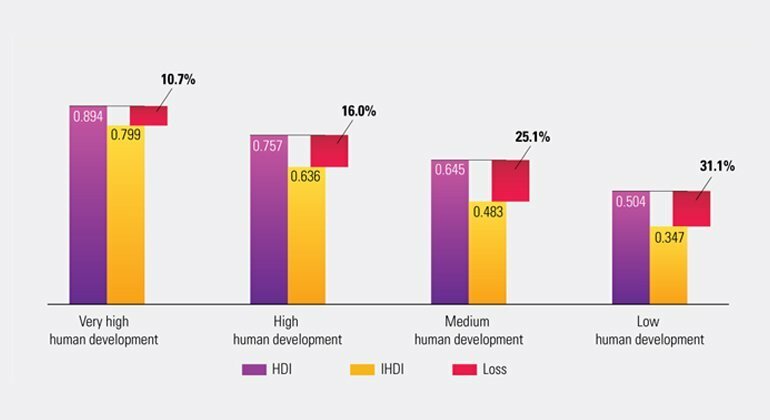 The global HDI value in 2017 was 0.728, up about 21.7 percent from 1990. Across the world, people are living longer, are more educated and have greater opportunities. Most people today live longer, are more educated and have more access to goods and services than ever before. But living longer does not automatically mean more years spent enjoying life. For example, healthy life expectancy for countries of very high human development is approximately 70 years, whereas for countries of low human development it is approximately 53 years. 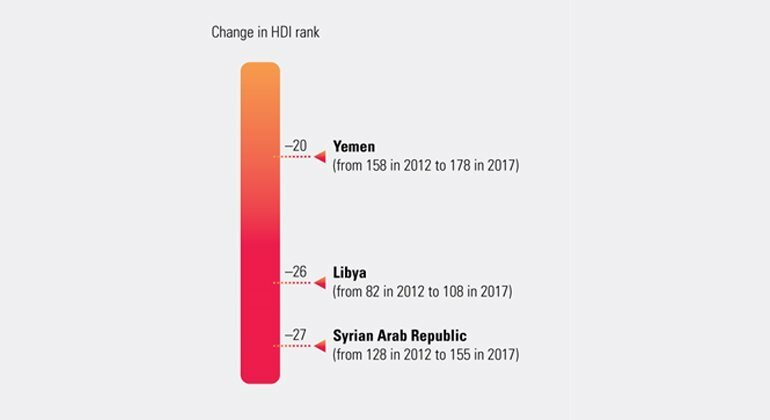 Between 2012 and 2017, Libya, Syria and Yemen had falling HDI values and ranks – the direct effect of violent conflict. Although Lebanon is not directly involved in violent conflict, it has suffered spillovers from the conflict in Syria, hosting more than a million Syrian refugees. 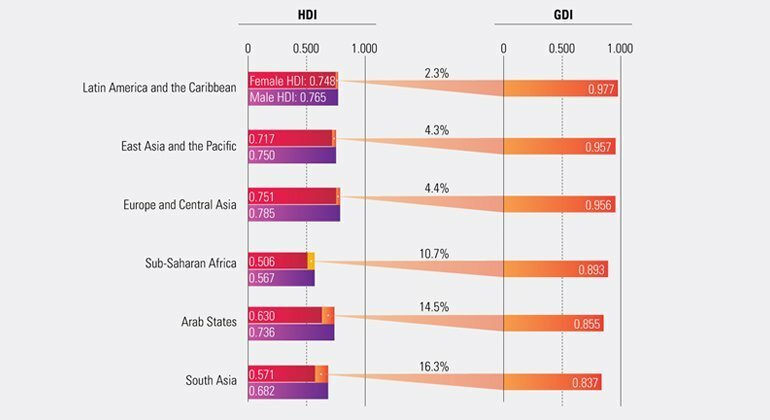 Average HDI levels have risen significantly since 1990 – 22 percent globally and 51 percent in least developed countries. But there remain massive differences across the world in people’s well-being. One key source of inequality within countries is the gap in opportunities, achievements and empowerment between women and men. 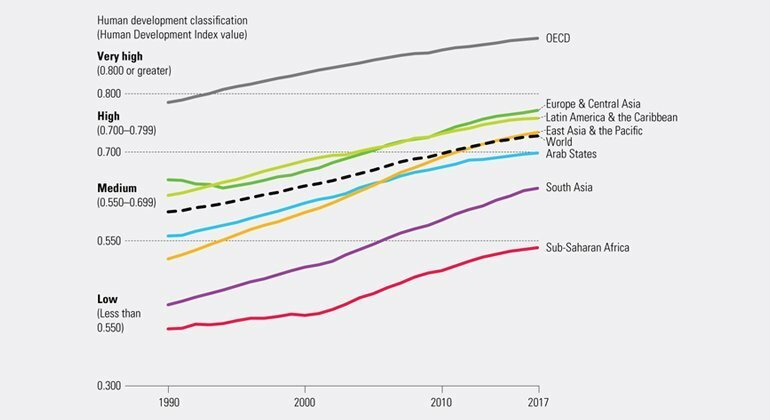 Worldwide the average HDI for women is six percent lower than for men, due to women’s lower income and educational attainment in many countries. Although there has been laudable progress in the number of girls attending school, there remain big differences between other key aspects of men and women’s lives. Women’s empowerment remains a particular challenge. Global labor force participation rates for women are lower than for men – 49 percent versus 75 percent. And when women are in the labor market, their unemployment rates are 24 percent higher than their male counterparts. Women globally also do much more unpaid domestic and care work than men. 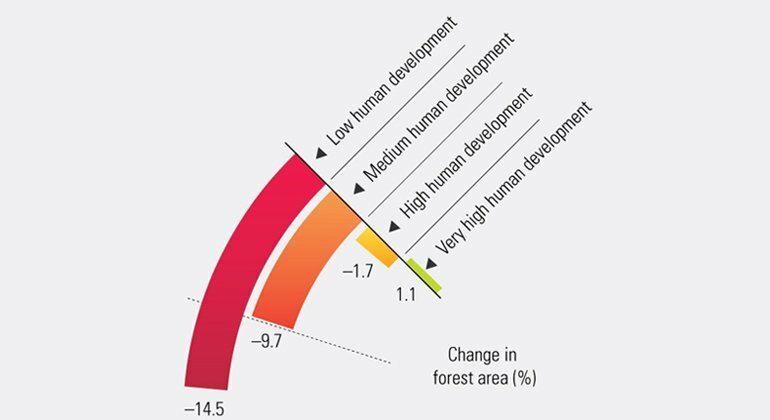 The degradation of the environment and atmosphere, coupled with significant declines in biodiversity, is linked to other development concerns ranging from declining food and water supplies to losses of livelihood and life from extreme weather events. This profoundly serious crisis threatens the human development of current and future generations.